Being Frugal and Making It Work: Win a Family Vacation - Little Miss Coppertone Contest! Win a Family Vacation - Little Miss Coppertone Contest! Summer is just around the corner which means most of us have beach days and poolside play dates in our future! Along with the bright sun, fresh produce and vacation plans, there's another symbol of summer that's immediately recognizable- the Coppertone girl! This summer, Coppertone is giving all littler girls the chance to embody this wholesome and charming icon with their Little Miss Coppertone Contest. Coppertone is celebrating little girls by searching for the one who best personifies the spirit of Coppertone. In order to enter, simply submit a photo of your little girl, ages 2-8, before June 22nd! Special guest judge Alison Sweeney will lead the judging team in selecting finalists and starting on July 13th, America will vote to choose the next Little Miss Coppertone! The winner gets a dream family vacation and will be featured in a Coppertone print ad! 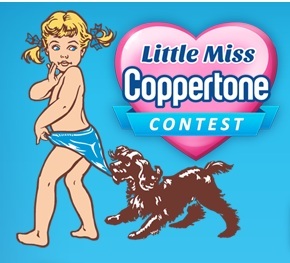 To enter the Little Miss Coppertone contest and read the official rules, visit the Coppertone Facebook page. **No Purchase Necessary. Contest Ends on 6/22/12.